In the Introduction to this booklet, reference has been made to the development of the Midland Bank and the City of Birmingham alongside each other and the similarities in their Coats of Arms. Perhaps surprisingly, the Midland Bank did not gain the approval of Garter King of Arms for a Coat of Arms until 1952, but had previously used a device based on a shield incorporating elements from the Arms of the Cities of Birmingham and London, on cheques and statements. It would appear that this device was instigated after the amalgamation of the Midland with the City Bank and the earliest examples were seen in 1899. As we shall see in the accompanying page, there were variations in its production. The introduction of the motto “Vis Unita Fortior,” (“Strength United is yet Stronger”) could well date from the same time, but, from discussions with the Bank’s Archivist, it would appear that the Holden Founder’s Jewel, pictured along side, and which must have been manufactured in late 1902, is the earliest confirmed example of its use. It is interesting to see the changes in approach over the years. 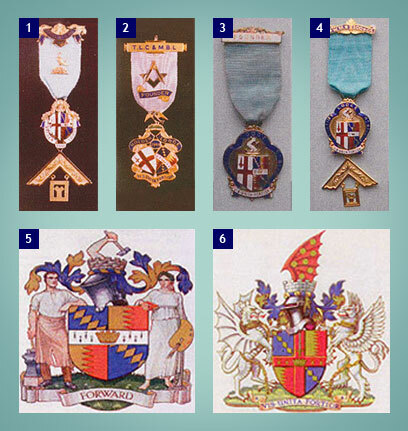 In the Holden Founder’s Jewel, the city shields remain separate in juxtaposition, a style still used by Holden Lodge as their device on Summons and other documents, whilst on their Past Master’s Jewel, the designs are combined into a single shield. This is the style followed by all the “Sister Lodges” for their shields, although other appendages vary. Notably, Fortior Lodge retains the hammer from the City of Birmingham. The latest change involves the Midland Bank itself, where heraldic guidance brought the sword and red cross of London into the body of a single shield. Throughout all these changes, the motto “Vis Unita Fortior” remains intact. 1. Holden Lodge Past Master’s Jewel. 2. Holden Lodge Founder’s Jewel Belonging to the Late Sir Edward Holden and presented to that Lodge by W. Bro. Sir Cassie Holden LGR in July 1961. 3. Fortior Lodge Founder’s Jewel belonging to II W. Bro. D.E. Sutton, P.J.G.D and presented to the Lodge by his Widow Mary in 1995. 4. Fortior Lodge Past Master’s Jewel. 5. Coat of Arms, City of Birmingham, 1889 -1976, The Shield is adopted from the seal of the de Bermingham family Lords of the Manor from the Norman Conquest to 1552. 6. Coat of Arms Midland Bank Ltd 1952.